from Cupcake Heaven, p. 21. Lately, I’ve been looking for cupcake recipe books that range outside the parameters of children’s bake sales and birthday parties. Was there, I wondered, an adult cupcake cookbook? It didn’t take me long to find a few that have interesting cupcakes, including savory ones. This book, in particular, looked promising. It contains recipes for Lavender cupcakes, Orange and Poppyseed Cupcakes, Rosewater Cupcakes, Maple and Pecan Cupcakes, as well as the usual holiday sorts of confections. This carrot and cardamom version appealed to me. It had all the appeal of carrot cake plus the promise of cardamom. However, I had to make a significant change to the recipe. I refused to buy self-rising flour. So, I substituted all-purpose flour and 1 teaspoon of baking powder for it. I couldn’t detect a difference. All in all, the cupcake tasted a little bland. Next time, more cardamom, a pinch of sea salt? The mascarpone worked very well. Shadowcook: Next time, I’m going to increase the cardamom to 6 or 7 pods. And once again I used the Kohn Rikon ratchet mill to excellent effect. Shadowcook: I used instead 1 1/2 cups of all-purpose flour and 1 teaspoon of baking powder. Shadowcook: Use the small-holed side of the grater. Put the sugar in a bowl and break up using the back of a fork, then beat in the oil and eggs. Stir in the orange peel, crushed caradmom seeds, and ginger, then sift the flour into the mixture and fold in, followed by the carrot and nuts. Spoon the mixture into the paper liners or silicone molds and bake in the preheated oven for about 20 minutes until risen and a skewer inserted in the center comes out clean. Transfer to a wire rack to cool. 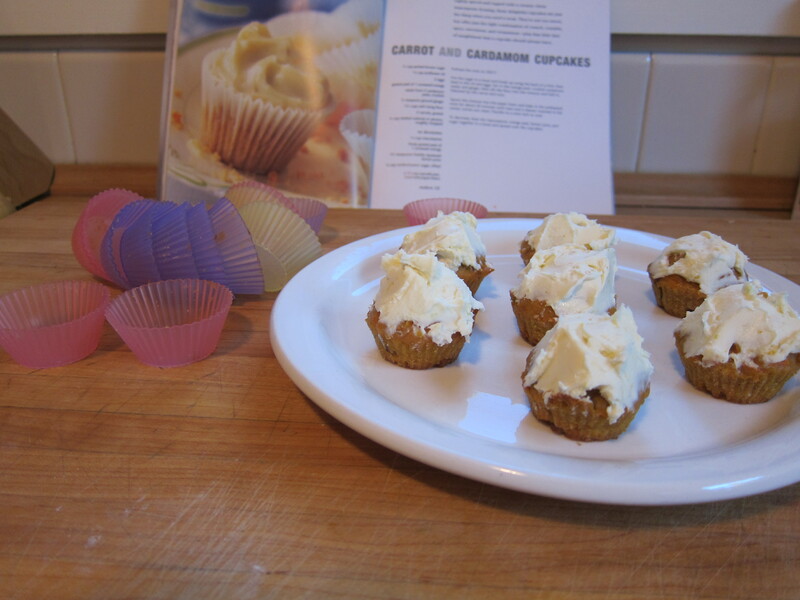 To decorate, beat the mascarpone, orange peel, lemon juice, and sugar together in a bowl spread over the cupcakes.